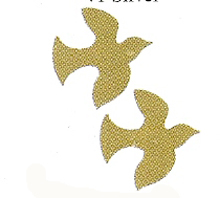 Whether for the celebration of a Golden Wedding Anniversary, a wedding or to symbolize doves of peace, these tiny gold dove confetti will add class to your decorations. 1/2 oz. bag. If used to sprinkle around centerpieces, one bag does 2 1/2 tables. Color matches to the gold bells confetti. Regular price $2.00 per bag. 11 bags available.